I enjoy how our equipment and expertise can become a resource and inspiration for other film events. Our regular programming certainly takes thought and planning, but it is always interesting to find other ways off getting film out into the community. We tend to do slightly different things each year, depending on enthusiasm and energy, though we normally have at least one thing in the year that we’ve not done before. 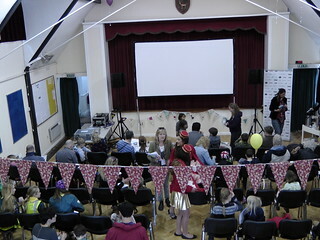 For example, a few years ago we ran a small comedy film festival over a weekend, which attracted parts of the community that don’t come to our regular films; it also encouraged some new volunteers to get involved, which was a great bonus. Reaching out to different/new audiences is important, though has undoubted challenges. You invariably need to rethink your promotion activities, and keep plugging away at it, so you need a dogged energy to sustain it. We have been working with Transition Forest Row for some years now. 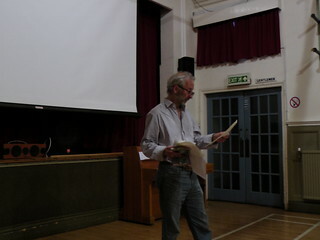 Mike Grenville initially used to run film events in the local community centre and elsewhere. Then, when we got our new equipment, it made sense to use that, and so the Transition strand to the films in Forest Row programme is now an established and successful part of the year’s films, and is a perfect example of a community film partnership. 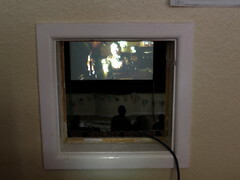 On Friday we screened the very last film this season, which was part of the Transition Forest Row programme. Sourlands was a fascinating film about a small part of New Jersey that hasn’t been urbanised, illuminating many issues around farming, biodiversity loss and energy, and how different people have responded locally. As is often the case with Transition films, Mike had brought along some interesting things for us to consider; this time it was the great solar lamps from Solar Aid, designed to reduce dependence on kerosene in Africa, and also jolly useful here too. You can get one from Mike, which will also enable more to be sent to Africa. This weekend has also brought a completely new film partnership. 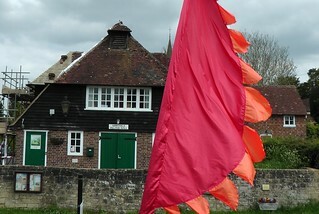 It has been the second StoryFest in our neighbouring village, Hartfield, and we’ve delivered a couple of events in this brilliant (and brilliantly-run) festival. The catalyst for our taking part was the Buster Keaton screening we did at the last Forest Row Festival back in October, when several of the StoryFest organisers came along. Hartfield village hall is smaller than that in Forest Row, but it also has a projection box, so it was just about possible to get our portable screen set up at the right distance from the projector with our long throw lens. Films were certainly screened in Hartfield many years ago, but haven’t for some time since the projection hole had been blocked up, and had had to be opened up for these films. Before Bugsy Malone was a film, it began life as a story I used to tell my four children on long (and sometimes boring) car journeys. I started with the lead characters: Bugsy, Tallula, Fat Sam and Dandy Dan and the story just grew on from there. Finally, this morning it was back to Hartfield for the silent comedies. A full house enjoyed the delights of Charlie Chaplin in The Floorwalker and Laurel and Hardy in Big Business, with Chris Harrison superbly playing the piano. A few of the kids dressed up as Chaplin or (one of) Laurel and Hardy, and it was great to hear their responses. The favourite was undoubtedly Big Business, with lots of beaming faces at the end, and a few attempts at pratfalls on the way out. So, on the way out of this weekend, what other events will next season bring? We’re still planning the fine details, but it is very likely that there will be a couple of Saturday screenings of longer films with a meal break, which was such a popular formula when we screened The Mahabharata. I’m hoping that there will be a big screening elsewhere in the village too, which should be a great special event, and there will be more matinees as before. Beyond that, there may well be some things we don’t event know about yet. We can’t do everything, however much we’d like to, but weekends like this one are perfect examples of how more and different film events are possible once you partner with others. A big thank you to Mike Grenville of Transition Forest Row, Emma Stillwell and the StoryFest team, and Ryushi Lindsay, for making a busy weekend out in the community a delight to do, and so easy.